In recounting childhood memories I focus on the good times. This simply works for me. I like to revisit places from my remembered youth and recount the feelings, people and conversations that made these places special for me. Every single time I travel to Ringsend in Dublin I feel my father close by me. It was one of his favourite places and it is one of mine too. We walked to that red lighthouse on the end of the Great South Wall so many times during my childhood. Sometimes on sunny days when we were left sweating by the walk, and other days when rain whipped our faces leaving them to tingle for ages afterwards. This prominent and popular landmark evokes so many happy memories for me and I have continuously visited this place throughout my life with my children, visitors, and my family. My Dad loved Dublin. He was reared on a farm in Celbridge in County Kildare and later in Milltown, Dublin 6, but he always loved the buzz of Dublin’s city centre. He loved the pubs around Grafton Street. The Baily, Sheehan’s, Neary’s Peter’s and Bartley Dunne’s. 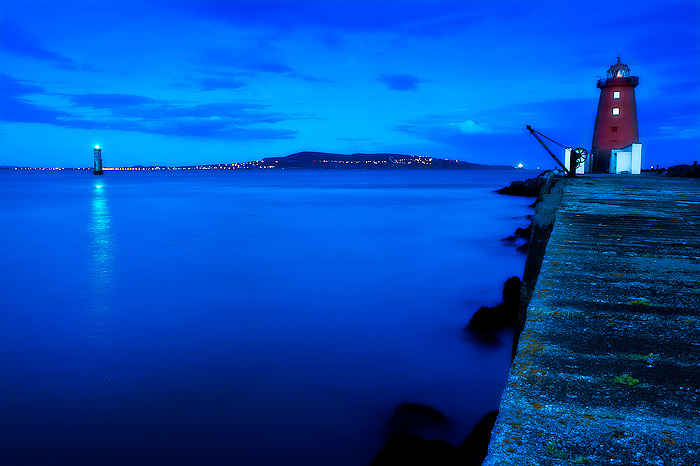 Dublin City was my playground when I was growing up. Almost every Sunday morning from the time I was about 7 years of age, my Dad took my siblings and I on magical mystery tours around Dublin exploring places of interest. We visited museums, churches, art galleries, parks, restaurants/cafes and the regular Dublin streets. Our finishing up point was usually feeding the ducks in Stephens Green before he went for a pint or two before driving us home for dinner no later than 2.30pm. Our day started with breakfast at 7am and mass at 8am. The day was ours after that and we packed so many things into those few hours. Sunday mornings in Dublin in the ‘70’s had a different feel to how things are today, particularly around the docks area. I remember the drivers running cows down the north quay towards the Isle of Man ferry that used to dock on the quayside where Jury’s hotel is now situated. The men used to tap the cattle with sticks to corral them in to the boat. Livestock and foot passengers shared the same vessel on their passage across the Irish Sea. I was witness to many departures. The cattle mooed loudly not realising they were on their way to an abattoir, while the passengers were usually in great form, laughing and full of anticipation about their holliers to the Isle of Man. In later years I often wondered who got the short end of the straw? The City Docks in Dublin in the 70’s was full of Stevedores and Dockers who were hard working men that unloaded boats, lifted crates, shifted livestock, and manually kept the port functioning. This was Dublin before the introduction of roll on roll off container trucks. All freight before this was held in cargo bays buried deep in the depths of the ships that docked alongside the quays and were emptied by cranes and dockers. I clearly remember a day when my Dad drove down to Alexandra Quay where a cargo boat was unloading. (There was no security in those days and the quays were accessible to all). We kids hid ourselves as instructed, and kept out of sight behind a corner while we watched the crane operator drag nets of crates from the hold of a ship and drop them on the quayside. The dockers would then drag and stack the crates manually into neat piles. Fork Lift trucks whizzed around picking them up shifting them into adjacent warehouses. I watched my Dad quietly and surreptitiously “have a word” with a crane operator as he slipped him a few bob, and a few moments later some crates fell apart as they were lowered onto the quay. He quickly prompted us to run and gather as many of the thousands of oranges that were rolling all over the place that we could. I absolutely remember the excitement and laughter as my older sister and I along with our younger brothers, bolting from behind our shelter and gathering as many of those ‘exotic’ fruits that we could…. The grey concrete quay was a pool of rolling oranges filled with colour as the fruit scattered in all directions. Our car smelt of sunshine for weeks afterwards. Dublin city had a much more relaxed feel about it back then. Health and safety as a concept hadn’t even been invented. 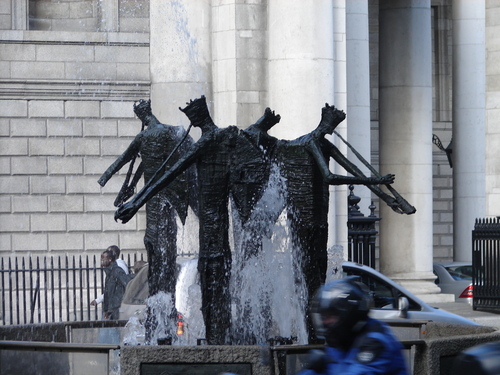 On another Sunday morning I remember parking in Dame Street opposite The Bank of Ireland on College Green where my Dad cautioned us kids to ‘watch out’ for police men as we saw him dash to the “Angels Fountain”. He emptied a full box of powdered washing detergent into it and ran back to the car where we all hid with our heads down as we watched the suds gather and get bigger and bigger until they eventually poured outwards onto the street. We all giggled and laughed as the bubbles poured out all over Dame Street and the people who were out and about suddenly found themselves in a 1970’s version of a foam party…..
Dublin in the 70’s may have been an economically depressed place in comparison to what it is today, but it’s where my Dad fostered the absolute love that I have for my hometown wrapped up in the simplest childhood memories of time spent with him. Was this his destiny or mine? This entry was posted in Uncategorized and tagged Dublin, family, Ireland, Life. Bookmark the permalink.